When you live in a city as overwhelmingly large as Beijing, it’s only human nature to mentally shrink it to a more manageable size. That explains why a friend once said to me “Chaoyang is Beijing.” Certainly, when we lived in Chaoyang, we hardly ever made it over to the west side of the city. Since we’ve moved out to Shunyi one of the advantages I’ve discovered is that parts of Beijing which previously seemed inaccessible are now within easy reach. 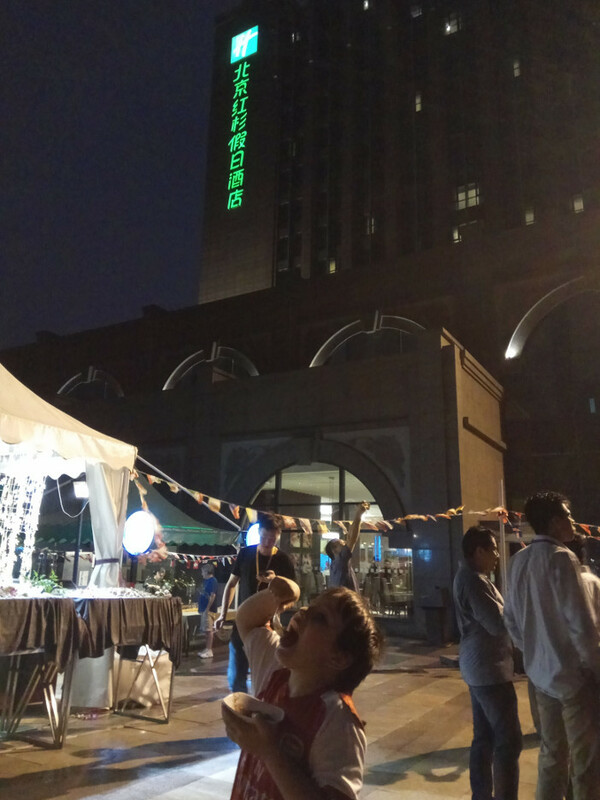 And so it was that we found ourselves as guests of Holiday Inn Haidian, to check out their summer barbecue. It’s a single journey on line 15 – admittedly all the way to the end of the line, but without the lengthy walks involved in transfers, the journey was a very manageable 45 minutes. 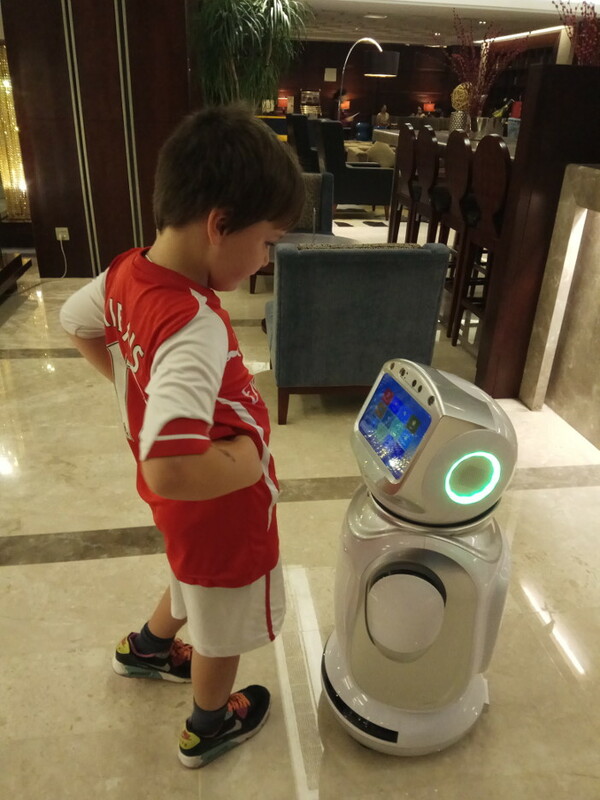 Our first surprise on arriving at the hotel was being greeted by a robot! Like all proper barbecues, the food is cooked outside, and when we visited, nearly all the guests were eating outside, in spite of the enormous storm thundering over our heads. Indeed, the torrential downpour completely failed to quench the high spirits of a party of students from nearby Tsinghua University. Their hilarity was raucous but good-natured, and the other families in attendance joined in the party atmosphere as we did. The chefs were busy preparing a range of treats: oysters, sausages, chaun’r, and beef. The shrimp were meaty and succulent, but our favorite was some mouth-wateringly tender lamb. The grilled meats were accompanied by a variety of breads, salad and plentiful melon. 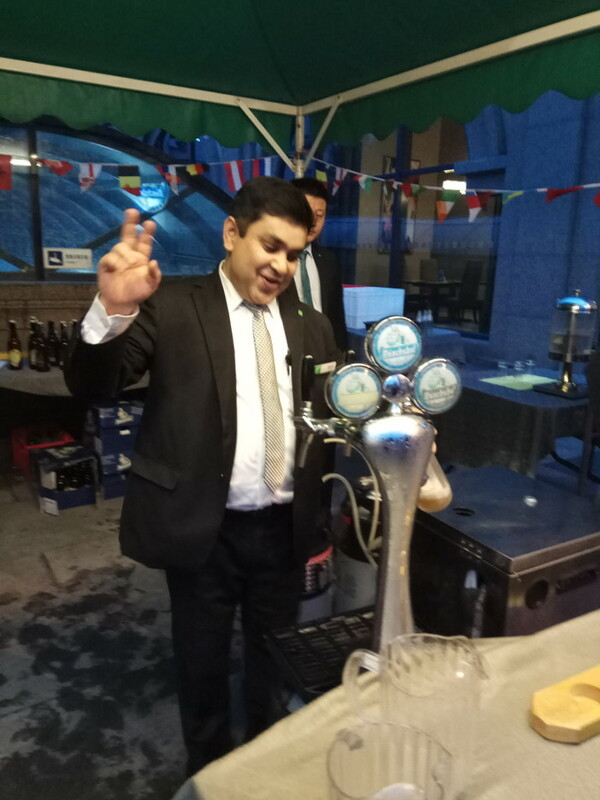 The beer which the students were enjoying so much was Mönchshof imported from Germany, with a choice of a mellow wheat beer and a rich black beer. For dessert, there was a choice of four flavors of ice cream: vanilla, green tea, strawberry and a truly intense chocolate. 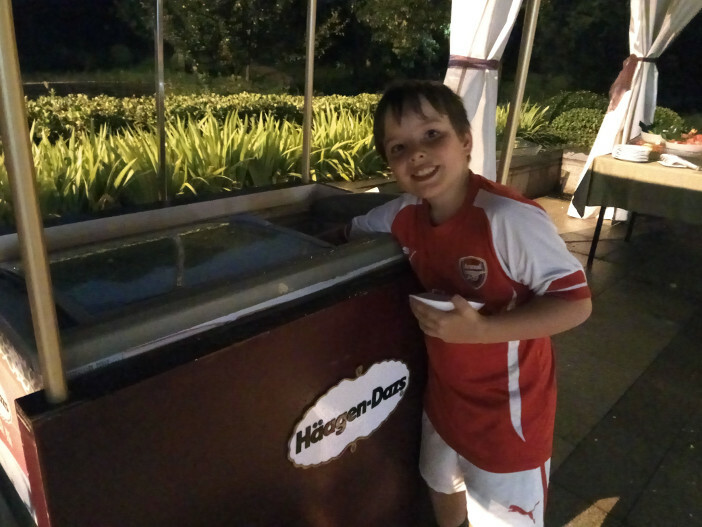 My boys were less than keen on the green tea variety, but being allowed to scoop their own ice cream was the highlight of the night for them. 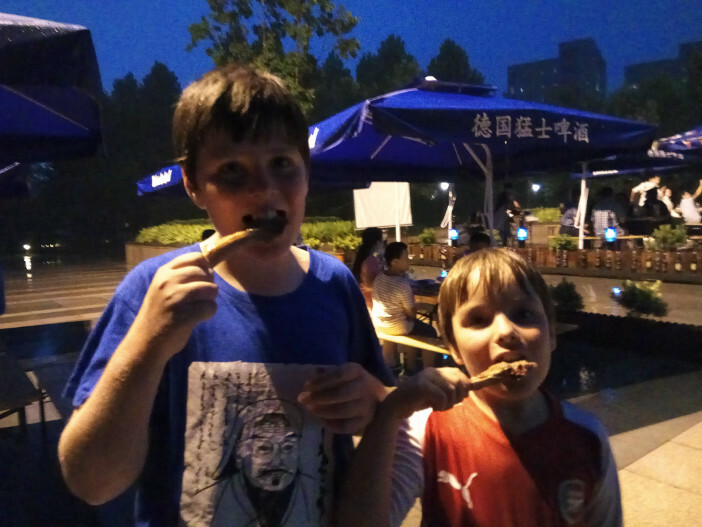 The barbecue takes place every Friday and Saturday evening, from 6.30pm to 10pm, until the end of September. Tickets are 258 RMB, though group discounts can be negotiated. Calling to book is essential, on 8239 8888. Holiday Inn Beijing Haidian, Building A, No. 89, Shuangqing Road, Haidian District. 红杉假日酒店 100085海淀区双清路89号A座.